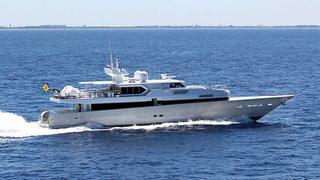 John Cohen at Merle Wood & Associates tells me he's signed the 39m motor yacht Echo for sale. Originally built by Australian yard Oceanfast in 1990, she went through a major conversion by Sensation Yachts in 2003 when she was also lengthened. A number of famous designers collaborated on the project including Phil Curran, Jon Bannenberg and Anita Unger for the décor. A subsequent refit in 2008 saw her completely repainted, and she's been upgraded again in 2013. Echo accommodates eight guests in four staterooms, and reaches top speeds of 24+ knots. Available to view in South Florida, Echo is asking $5,495,000.